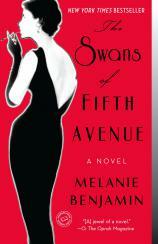 THE SWANS OF FIFTH AVENUE, Melanie Benjamin’s captivating new historical novel, opens with an epigram by the great Diana Vreeland, editor of Vogue and arbiter of 20th-century style, advising that “The best time to leave a party is when the party’s just beginning.” If only the beautiful people Benjamin writes of heeded this warning. One of the great literary achievements of the last century was arguably the “nonfiction novel” IN COLD BLOOD, and its author, Truman Capote, was certainly one of the most famous and infamous figures in literature. One thing he did with as much aplomb as his writing was his socializing with the crème de la crème of New York society. In fact, he seemed to spend more time doing this than actually writing. He loved to surround himself with beautiful people, and none were more beautiful than his beloved Swans, the loving nickname for the wives of the rich and powerful with whom he spent most of his time: Slim Keith, Marella Agnelli, Gloria Guinness, Pamela Hayward Churchill, C. Z. Guest and Babe Paley. Each one was exquisite in her own right, but no one was quite like Babe Paley: “Babewas style… They all noticed her, her tall, slender frame, her grave dark eyes, the way she had of holding her handbag in the crook of her arm, the simple grace with which she pushed her sunglasses on top of her hair or unbuttoned a coat with just one hand, allowing it to fall elegantly from her shoulders into the always-waiting arms of a maître d’.” In Babe, Truman immediately found a kindred spirit --- someone who, despite the smile and the trappings of her lifestyle, still wore an air of loneliness about her like this year’s Paris fashions. "THE SWANS OF FIFTH AVENUE faithfully and accurately portrays the elegance of New York of the ’50s and ’60s in such vivid splendor, it makes you want to order a smart cocktail with lunch, like women used to do." Barbara Cushing Mortimer Paley was not a great intellectual or a ravishing beauty, but she knew how to maximize what she had to make one think she was all those things and more. “I was raised to marry well,” she always said. Driven by her mother’s aspirations that her daughters marry well, Babe became the perfect accompaniment to a well-bred man’s success. After her first marriage ended in divorce, she married William Paley, the founder and chairman of the board of CBS, advisor to President Eisenhower, the man who discovered Bing Crosby, Lucille Ball and newsman Edward R. Murrow, to name but a few. Babe was happy to accompany William, on his arm looking fabulous, and taking great care to always be ready with his drink when he came home after a hard day’s work. She worked hard at the illusion of the perfect life, going as far as to never let him see her without makeup. Her friendship with the impish Truman Capote added a new dimension of fun that had been missing from her full life. And it paid to be friends with the Paleys --- a friendship that included perks like exotic vacations around the world, long weekends spent at their homes in either Jamaica or on Long Island, and the most important to Truman: the entree into New York society that his mother so yearned for but never truly achieved in her lifetime. Being friends with Babe and the other Swans gave this odd little country boy, not-so-closeted homosexual who never fit in carte blanche to the best New York had to offer, not to mention the added bonus of providing him with the best material any eager writer could ask for. Why then would Truman betray his Swans by revealing all their secrets in his writing? Was is Truman being his own worst enemy, or was he just being a writer?